Live Liberties: Built to Spill wrote the book when it comes to changing songs onstage. "After we finished the Ancient Melodies of the Future record," BUILT TO SPILL's guitarist DOUG MARTSCH tells me, "I wasn't into making rock music." Hearing Martsch drop that particular conversational bomb is a bit like hearing that DA VINCI's not so into drawing this year or that GAUDI is going through a minimalist phase. Taking four years off from his seminal "indie-but-on-Warner" group, Martsch turned his ears southward to the sounds of MISSISSIPPI FRED MCDOWELL and the slide guitar. "I started listening to the blues a bunch," Martsch says. "I really liked how the slide guitar sounds. I wanted to learn all the open tunings and the techniques, but I didn't want to figure out blues songs, so I would just make up my own tunes." These little practice ditties slowly solidified into tunes and eventually word got out that Martsch was onto something new. Shortly thereafter, he called in some friends to flesh out his new slide études. Eventually, the label got a hold of a copy of some of the recordings, and released it as Now You Know. "It wasn't a conscious decision to put it out," says Martsch of his only solo record to date, "it just kind of happened." While that album is an interesting exploration of the songs of the South, the siren call of Built to Spill raised its head once more. So Martsch got the band back together. "We were all burned out on doing it so hard for so long that it wasn't very fun for a little while. By the time we started playing again, I was really excited to do it again." Built to Spill is partway through recording its first album in four years. The group is working up in Portland with a new producer, STEVE LOBDEL, in his brand new studio, Audible Alchemy. Though the group's signature vocals and sweeping arrangements are firmly in place, the material sounds very different. This probably has a lot to do with the new approach the group decided to take. "On the last one," Martsch says, "I wrote all the songs myself. They were all really simple and the band just kind of learned them. This time out we jammed tons and tons." Listening to the tapes in his Boise home, Martsch went through and picked out the finer moments. These became the seeds for the new record. 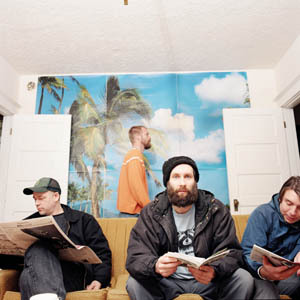 The group process has also helped Built to Spill try new approaches to its back catalog. Unlike so many other rock bands, this group is continually revamping its old material for the road. Sometimes it's hard to tell what tune you are actually hearing. "We take a lot of liberties when we play songs live. Over a few years, by playing them every night and not listening to the records, they've evolved. Sometimes we even cut things out. Other times we extend things. It depends on the song. We are not opposed to totally changing things in any sort of way." From the July 6-13, 2005 issue of Metro Santa Cruz.